Home > Political > America > America Divided – Similar To Today! America Divided – Similar To Today! Radical Northern Republicans whose attitude was ‘slavery is wrong–end it now’. They believed all human lives mattered, whether on or off a plantation, and all were equal, created in the image of God. This group included abolitionists, the Underground Railroad, anti-slavery preachers, and, unfortunately, the fringe John Brown who shot at slave owners. Moderate Republicans whose attitude was that slavery is wrong but the country should transition out of it gradually over time. Practical Neutral Voters who could care less about the value of human life. They were more concerned about their pocketbook, jobs, wages, economy and tax-tariff issues. Moderate Southern Democrats whose attitude was ‘slavery is wrong, but it was settled law and the nation should just live with it. People should have the choice whether or not to own a slave–just treat your slaves nice’. Extreme Southern Democrats whose attitude was ‘slavery is good and should be expanded into new Territories and States’. They wanted Northerners who were morally opposed to slavery to be forced to participate in supporting it through the Fugitive Slave Act of 1850. Pro-Life Republicans whose attitude is ‘abortion is wrong–end it now’. They believe all human lives matter, whether in or out of a womb, and that all are equal, created in the image of God. There are also fringe “John Brown types” who shoot at abortion clinics. Establishment Republicans whose attitude is to reluctantly agree to a gradual limitation of abortions. Extreme Democrats whose attitude is that abortion is good and that it should be expanded though nationalized healthcare and global U.N. initiatives. They support the selling of aborted baby body parts, and insist on forcing those who are morally opposed to abortion to participate in supporting it, even suing Hobby Lobby and the Little Sisters of the Poor. Likewise, we cannot survive as a free nation when some men decide that others are not fit to live and should be abandoned to abortion. The Civil War started initially as a States’ Rights controversy, largely over tariff taxes on imports collected at Southern ports, burdening the Southern economy — which unfortunately was dependent on slavery. It appeared that the Confederate South would quickly win. Lincoln faced draft riots, ruled by decree, enacted martial law and suspended habeas corpus–which allowed the Federal government to arrest anyone without a warrant. This revealed the Confederate plans, allowing the Union forces to gain an advantage at the Battle of Sharpsburg, Maryland. The Emancipation Proclamation had the effect of giving the North the moral high ground, causing European support of the Confederacy to evaporate–as no country wanted to be perceived as supporting slavery. “In giving freedom to the slave, we assure freedom to the free … We shall nobly save–or meanly lose–the last, best hope of earth. 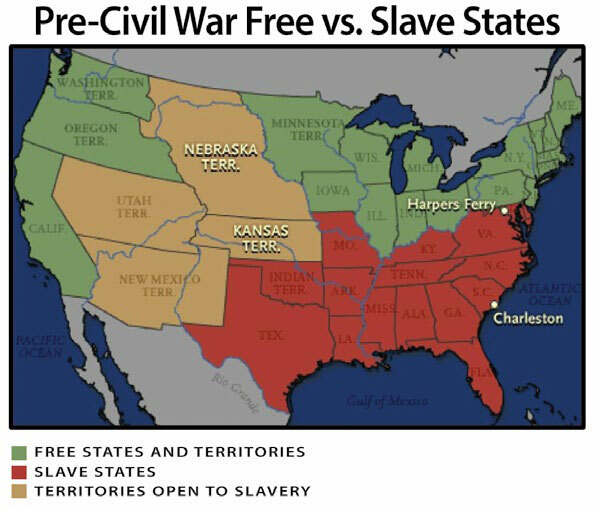 The Emancipation Proclamation did not attempt to free slaves in Northern states as they were not in rebellion and therefore there was no legal ground for the President to overrule the legitimate governments of those states. With the South being a “war-zone,” the President argued that his title as “Commander-in-Chief” allowed him in time of war to exercise executive powers in those States at war. Congress saw this as an unconstitutional usurpation of power. An amendment required 2/3’s of Congress to approve it, as portrayed in Steven Spielberg’s movie, “Lincoln” (2012). The 13th Amendment was passed in the Senate on April 8, 1864, with all 30 Republicans voting in favor of it, joined by only 4 Democrats. The 13th Amendment was passed in the House on January 31, 1865, with all 86 Republicans voting in favor, joined by 15 Democrats, 14 Unconditional Unionists, and 4 Union men. Though Republicans were successful in their efforts to officially abolish slavery, Democrats in Southern states passed Black Codes, Jim Crow Laws, and created racial vigilante organizations. Republicans responded by enlarging the Federal Government’s power with the 14th Amendment in 1868, ensuring civil rights for freed slaves in the States. Republicans then pushed through a ban on racial voting restrictions by passing the 15th Amendment in 1870. These amendments were great “instruments of good;” nevertheless, they did have the unanticipated consequence of enlarging the federal government’s control over the states.